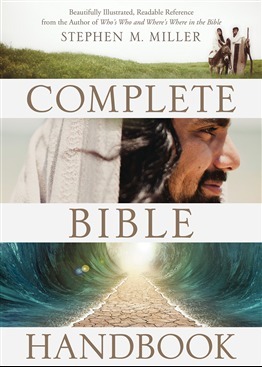 Here’s an easy, interesting, fun way to get to know your Bible: Read The Complete Bible Handbook, a beautifully illustrated guide to the highlights of God’s Word. Well-known for his readable Bible reference (including Who’s Who and Where’s Where in the Bible and The Complete Guide to the Bible, each with more than a quarter million copies sold), Miller offers compelling, easy-to-digest insights on all 66 Bible books plus scores of contemporary life topics in a section entitled “What the Bible Says About. . .” Other sections—such as “How Did We Get the Bible,” “Tough Questions Atheists Ask,” and “What It Takes to Be a Christian” make the Complete Bible Handbook a one-stop library of vital information—and it’s all written in Miller’s breezy and balanced style.